As the biggest and most versatile model in the MINI range featuring the brand's most powerful engine to date, the new MINI John Cooper Works Countryman combines race track feeling and useful versatility on and off the road. With an output of 231 hp working with MINI's ALL4 all-wheel drive system, the new MINI John Cooper Works Countryman sprints from 0-62mph in 6.5 seconds whether the customer chooses the standard 6-speed manual transmission or the optional 8-speed Steptronic sports transmission. 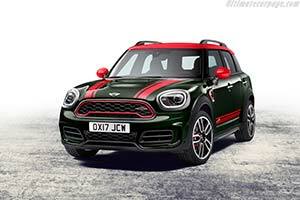 The resulting vehicle is a based on John Cooper Works racing expertise. From the engine and ALL4 drive system to the upgraded sports suspension with 18-inch John Cooper Works Grip Spoke alloy wheels and Brembo sports brake system, the John Cooper Works racing influence is evident throughout the model's build and design. Special exterior body features highlight the vehicle's sporty credentials, and optimise aerodynamic properties, whilst inside the vehicle features a model-specific cockpit and John Cooper Works sports seats. The new MINI John Cooper Works Countryman not only offers an exciting driving experience but with improved boot space and extra leg room over its predecessor it is both versatile and flexible. With a power increase of 13hp compared to its predecessor, the new MINI John Cooper Works Countryman also offers enlarged external dimensions and a considerable increase in space, versatility and functionality. The new MINI John Cooper Works Countryman is 19 centimetres longer, 3 centimetres wider and has a wheelbase extension of 7.5 centimetres over the previous model, offering even more space across its five passenger seats. The luggage compartment can also be expanded as required from 450 litres to as much as 1,390 litres. The 2.0-litre 4-cylinder engine installed at the front of the new MINI John Cooper Works Countryman demonstrates performance characteristics inspired by motor racing. It has a specific version of MINI TwinPower Turbo Technology with a turbocharging system integrated in the cast steel manifold, petrol direct injection, the fully variable valve control system VALVETRONIC and variable camshaft control (double VANOS). Made of highly temperature-resistant material, the turbocharger generates a charge-air pressure which is now increased to 2.2 bar. The engine puts its maximum torque of 350 Newton metres on stream at between 1,450 and 4,500 rpm. It delivers its peak output of 231 hp within an engine speed range of 5 000 and 6 000 rpm. The new John Cooper Works Countryman features specially developed components for John Cooper Works models, including specific pistons, a large charge-air cooler and an additional radiator. In addition there is a sports exhaust system that not only supports the engine's performance characteristics but also gives them an impressive acoustic and visual dimension. Reduced exhaust gas pressure promotes spontaneous power delivery, while a controllable exhaust flap and the special geometry of the tailpipe help generate the recognisable John Cooper Works sound. The sports exhaust system also has tapered chrome covers for the dual tailpipes. The standard 6-speed manual transmission is weight-optimised in design as well as exhibiting a high level of internal efficiency and shift comfort. A gear sensor enables active engine speed adaptation for fast gear changes. Short shifts and the model-specific gear lever knob facilitate precise gear selection. An 8-speed Steptronic sports transmission is also available as an option. Gears can be changed automatically or manually via the shift paddles at the steering wheel. It offers particularly short shift times and a Launch Control function enables the quickest possible acceleration from standing. This also has a positive impact on efficiency. With the standard manual transmission, the new MINI John Cooper Works Countryman has a combined fuel consumption of 38.2 mpg and a CO2 emissions level of 169 grams per kilometre. In conjunction with the 8-speed Steptronic sports transmission, these figures are reduced to 40.9 mpg and 158 grams respectively (provisional EU test cycle figures). Thanks to the MINI ALL4 all-wheel drive system, the MINI John Cooper Works Countryman offers high performance on a variety of surfaces. The ALL4 system not only improves traction on unsurfaced terrain such as dirt roads, but also enhances ride stability in adverse weather conditions and improves agility when taking bends at speed. The system's electronic control unit is linked to the DSC (Dynamic Stability Control), ensuring a consistently fast and precise response at all times in distributing the drive torque between the front and rear wheels. The current version of the ALL4 all-wheel drive system offers a particularly efficient form of variable power distribution due to its compact and weight-optimised design. It consists of a power take-off bevel gear on the front axle differential, a dual-section propeller shaft and a rear axle differential with an electrohydraulically controlled hang-on clutch. In order to reduce the torque loss that occurs when drive power is transferred to the rear axle, the new MINI John Cooper Works Countryman uses active DSC with the brand's characteristic front-wheel drive in normal situations on the road. Torque is driven to the rear wheels only when necessary and within a fraction of a second. The high-quality suspension technology of the new MINI John Cooper Works Countryman offers the perfect basis for maximum performance and excellent handling, with its high powered engine working alongside its specially designed long wheelbase, large track and low centre of gravity. A single-joint spring strut axle at the front is combined with a multilink rear axle. In addition, the standard sports suspension of the new MINI John Cooper Works Countryman features a particularly tight set-up of the suspension and damping systems. The speed-related Servotronic steering support - which is also offered as standard - provides excellent handling on bends and comfortable manoeuvring at low speeds. The sports brake system was designed in collaboration with specialist manufacturer Brembo and comprises 4-piston fixed-caliper disc brakes on the front wheels, guaranteeing consistently high deceleration rates even under intense use. The brake calipers are finished in red and bear the John Cooper Works logo at the front. The Dynamic Stability Control system also ensures optimum traction on sprints, agility on bends and safe deceleration. Its functions include Dynamic Traction Control (DTC), Electronic Differential Lock Control (EDLC) - which acts as an electronic locking function for the front axle differential - and Performance Control for agile turning when taking bends at speed. The standard trim also includes 18-inch John Cooper Works light alloy wheels in Black Thrill Spoke. John Cooper Works light alloy wheel in 19-inch is optionally available. MINI Driving Modes enables the driver to select a set-up that is geared towards the situation on the road and their own personal preferences. A rotary switch at the base of the gear or selector lever is used to select the preferred settings - Sport, MID and GREEN. This influences the characteristic curves of the accelerator pedal and steering, the engine acoustics, the shift characteristics of the 8-speed Steptronic sports transmission, if the latter is fitted, and the Dynamic Damper Control set-up.